OVERVIEW: In this series of books, Peg and Cat put their maths skills to the test to solve a variety of STEM related problems. 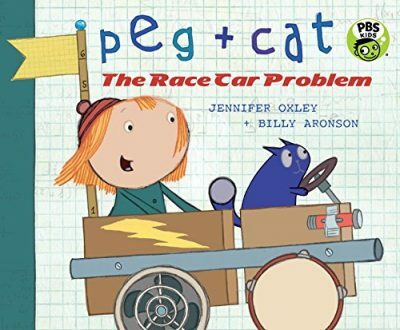 DESCRIPTION FROM THE PUBLISHER: Peg and Cat have built an amazing car out of things they found lying around. They’ve named her Hot Buttered Lightning (since she’s built for speed), and they plan to win the Tallapegga Twenty. If they can make it out of the junkyard, that is. It’s a good thing Peg knows the best shape to use to make wheels and how to count laps to see who is ahead. And it’s lucky that Cat reminds Peg to keep calm when she’s totally freaking out! Will Peg and Cat be the first to complete twenty laps and win the Golden Cup? Or will it be one of their quirky competitors? Count on Peg and Cat to rev up young problem-solvers for an exciting race to the finish.